Last month, I developed a Second Life Workshop and came across an interesting web 2.0 problem. The workshop is comprised of many small layered activities that participants complete as they build up the knowledge and skills in using Second Life. I wanted the participants to be able to document their exploits as they worked through the activities in a very simple, quick and convenient way. The purpose of this was to allow some reflection on what they were learning, share their experiences with the other participants, and illustrate mastery of skills learnt. Second Life being a visual environment meant there was considerable value in participants being able to take screenshots of their activities in-world. This added requirement complicates things considerably. I began playing with the Postcard functionality of the Second Life client. 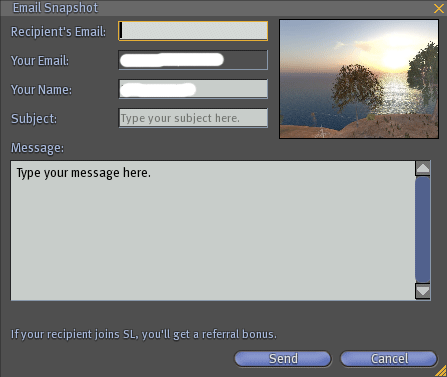 By clicking on the Snapshot button at the bottom of the window, you have the option of sending a postcard to an email address from within Second Life, the postcard being a snapshot of your screen. The postcard is essentially an email message as illustrated below, including a subject line, and a message body to accompany the “postcard” image itself. This I thought was the answer to my problem as it was simple, quick and convenient for the participants to use. The limitation of course was that it is only possible to email the postcard. They could email me their postcards as the facilitator, but that meant manually posting them online to share with the group, and that it would need to be done after the workshop, rather than during. So I thought about writing a small web application that acts as a gateway between the postcard emails from Second Life, and a web page or RSS feed. This however was not quite in the spirit of web 2.0. Surely someone else out there has solved this problem before. So I began searching, and I found quite a few different options. where you replace firstname and lastname with your avatar’s name (but leaving the plus sign in-between). This enabled me to retrieve postcards from individual participants. Then I created a Yahoo Pipe that aggregated feeds from all participants from Snapzilla into a single feed. Hey-presto, an RSS feed of the participants postcards. You can also view the feed, using the online RSS Reader FeedBucket. The feed is also visible on the right of this page in the sidebar if you are interested. Hey Damo – I had the same problem and yes, you’re right, the RSS isn’t so easy to find at sluniverse – I’ve no idea why! It’s important to use the RSS feed rather than the sluniverse website at there will always be the ‘most recent’ pics that other people have taken – and you never know what they might be! I never thought of piping multiple feeds together from different avatars – that would be ideal for my student groups next month! Great to hear from you again. Apologies for my tardy response. Neglicting my blog a bit lately. May I ask in what way are you using Second Life with your student group? I’d also be interested to hear how your use of snapzilla and feed aggregation goes.